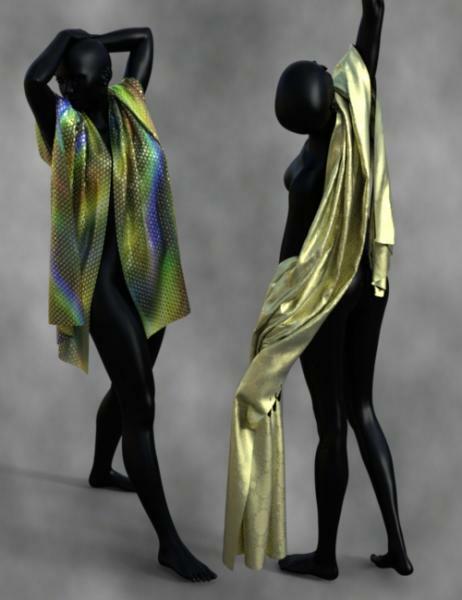 Untextured shader friendly morphing prop clothing accessory for Daz Genesis 3 Female figures. Comes with draped pose matching morphs for four different pose sets. Use scaling and translation to fit over clothing. and the Fashion Model Poses that come with Genesis 3 Female. sapat (5 months ago) Inappropriate? I don't have the Kalea poses since I didn't buy her, but I have the other ones. Thank you so much!! Thanks! Have a great 2018! Faeryl Womyn (2 years ago) Inappropriate? ledsofa (2 years ago) Inappropriate? MarleneTurcotte (2 years ago) Inappropriate? I don't know what pose sets this is for, the description does not say and there is no readme, and the side area only shows clothes, no poses if that was suppose to be the hint, so I am lost here. Does anyone know what the 4 pose sets are? Wilmap (2 years ago) Inappropriate? Thanks for these. Already donated to Jen. SimonJM (2 years ago) Inappropriate? Wonderful, just wonderful. Something I really needed. Thank you very much! I donated already to Jen, so sorry I can't do it this way. Novica (2 years ago) Inappropriate? Will be donating to Jen after the 1st. Such a sweet thing for you to do! IceDragonArt (2 years ago) Inappropriate? beemeekay (2 years ago) Inappropriate? Thanks for sharing this to help raise money for Jen's medical bill! I hope that many will donate, even if it's just small amounts. datemen (2 years ago) Inappropriate? Ferretmania (2 years ago) Inappropriate? Just the thing now that winter has descended upon us. Leilana (2 years ago) Inappropriate?